This year’s IMAC (International Marine Aquarium Conference) held at the Crown Plaza hotel in Chicago was hugely successful – lots of people and exhibits. However, what captured my interest in particular was a lecture by John Kelly on how to be successful with Goniopora sp.,and LED (light emitting diodes) light fixtures. 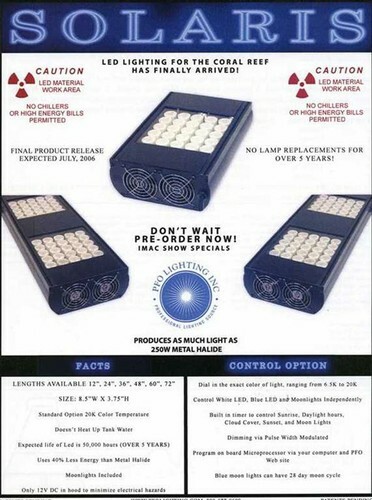 These fixtures may be the next significant technological development to come to our hobby. I have included a scan of the new company’s product information sheet. The manufacturer is sending one to Sanjay Joshi and Dana Riddle, who will test them and report back to us. They require moderate light and water flow. They need to be acclimated slowly to light and water motion conditions. They need to be placed where their tissue (polyps) have plenty of expansion room. Most importantly, they must be fed. He feeds his crushed cyclopeeze, by first stimulating a feeding response, only to return in a few minutes with more phytoplankton when the animal is ready. He feeds his every three days. There are a number of butterfly fish that will eat Manjano sp., like raccoon and threadfin butterfly fish, but none are reef safe. That being said, I think that the double saddleback butterfly (Chaetodon ulietensis) is the safest. The Waikiki Aquarium in Hawaii has had one in one of their reef tanks for many years. My experience has been excellent too, but there is no way of knowing what any individual fish might take a likening to. One thing is certain, the Manjano sp anemone must be eliminated or held in check in some way. They are a very invasive species and will destroy any reef tank if left alone. I should also point out that any butterfly fish that eats these invasive anemones can only eliminate those that it can reach. 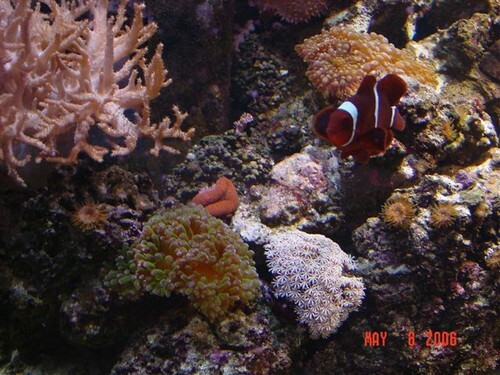 In the included photograph of Ken’s reef tank Majanos are plainly visible.